Gold is a very dense and heavy material. 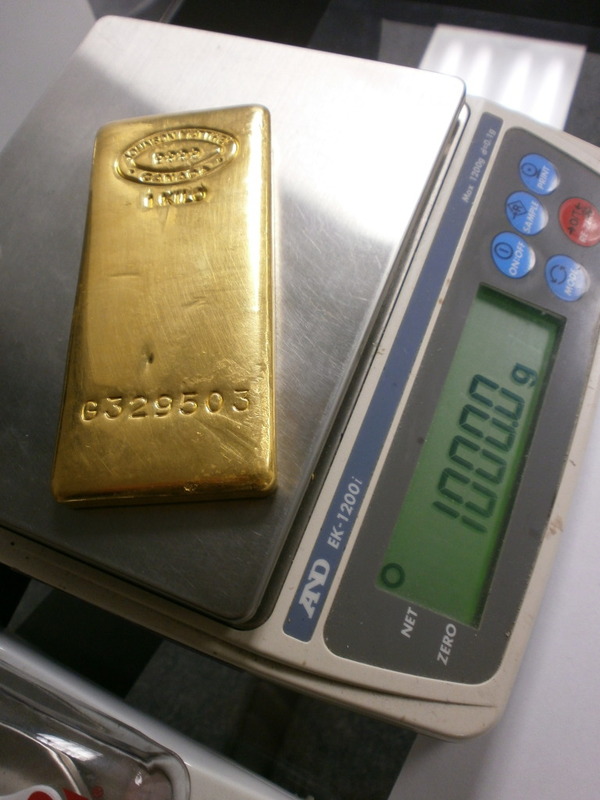 A one Kilo gold bar occupies about the same volume as an I-Phone or one of the thinner typical size Android smart phone devices. It is just that the while the smart phones weigh between 100 grams and 180 grams, a little more for the really big ones, the comparable dimensions gold bar weighs 1000 grams. For practical purposes, “gold bar” and a “gold ingot” are the same thing. basically the same thing. However, to get specific, a gold ingot is any piece, is any uniform profile piece of gold. A gold bar, is an oblong, flatter, rectangular profile ingot. A gold coin is also a type of gold ingot. However, in the case of the gold coin, the shape is a flat round. For easier gold storage, of course the most efficient shape is the bar. Central bank keep their precious metal mostly in the gold bars. There are two types of gold bars: Minted gold bars and poured gold bars. This type of gold bar is distinguished by sharp edges, precise mint marks and hard to reproduce graphical features. Good examples of this type of gold bar are the one gram to ten ounce troy Credit Swiss bars, Perth Mint, PAMP, SMI and Elemetal products. See images below. Minted bars were made by striking a piece of gold with a high power press with the mint dye. The result is that the dye cuts, shapes and imprints a design into the piece of gold. Most minted gold bars are 10 ounce troy and smaller. 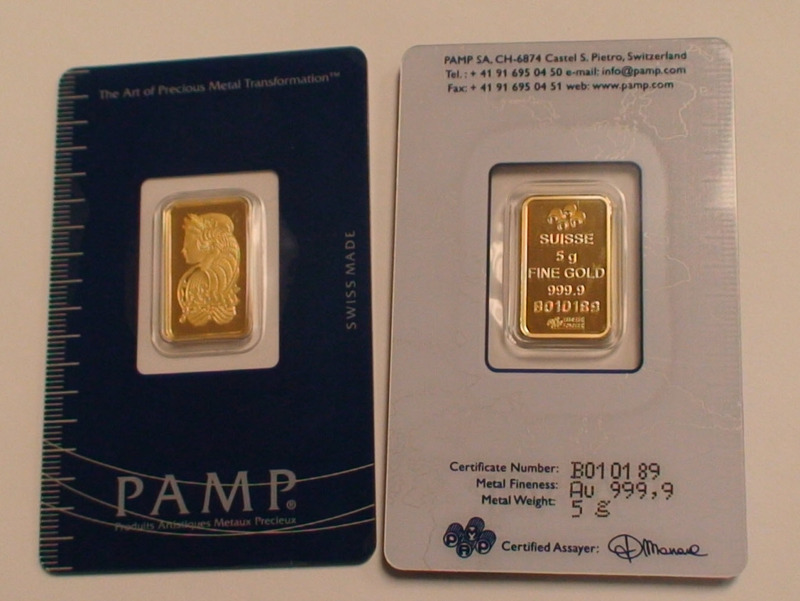 In addition, modern minted bars are usually enclose in a tamper evident blister pack which protects the bars, and serves as the the assay certificate. This type of gold bar is distinguished by its softer, rounded and tapered edges, which are the shape of the used mold. The mint marks, serial number and weight are tooled in while the bar is still hot. Another important feature is that poured bars are not as flat on the horizontal surfaces Now a days poured bars are mostly heavier, larger bars, with a mass too much for a mint press. Kilo bars and inter-bank bars are good example of poured bars. See image above and video below. Pure gold is pure gold. That is what matters. Modern gold bars are 9999 parts out of 10,000 parts pure. That is very pure. How much more pure gold can they get? However, precious metals are all about certainty. One benefit of minted bars is that they are rather thin, and have published dimensions. If the bar is of certain dimensions, has certain matching weight and matching mint marks and branding, the assay certificate is minted into it, and on top of that is inside known tamper proof packaging, then there is high certainty that the bar is pure gold. One disadvantage of poured bars is that they are of multiple dimensions and usually thicker. In addition, since the edges are rounded and tapered, they are hard to measure for precise dimensions. Usually mint marks and serial numbers are tooled in. Given all that, chances are that the bar is good, solid gold. However, there is much more room for fraud. So since this type of gold bar is much larger, often they get melted in order to confirm they are pure gold. Question: How much of a chance would you take when paying over $35,000 for a gold bar? Here at Portland Gold Buyers, LLC we buy gold every day. If you have a gold bar, call us at 971-222-3435. We will make you an offer.